Fascinating behind-the-scenes information is shared which sheds new light on the founding history of the NWU and the role of prominent figures. The books, Forging Unity: The story of the North-West University’s first ten years by Cornia Pretorius, and North-West University (NWU): A merger and incorporation story, 2004-2014 by Prof Piet Prinsloo, were launched today (Monday 4 December 2017) in Potchefstroom. Prof Prinsloo’s work was published as an electronic book while the book by Cornia Pretorius is available in print and electronic versions. The books were researched and written as part of a project commissioned by the office of the vice-chancellor of the NWU, but the authors retained full independence on the content. 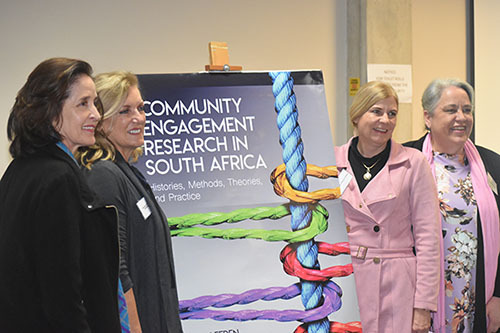 While Prof Prinsloo’s book is a more formal, document-based history, the book by Cornia Pretorius can be described as a popular or journalistic history focusing on the people and how they interacted in the emotionally charged merger process. She also covers the dramatic events that led to Dr Theuns Eloff’s premature departure. A former CEO of the Council on Higher Education, Ahmed Essop, describes the Pretorius book as “groundbreaking” while journalist Jan-Jan Joubert from the Sunday Times describes it as “a roller-coaster ride of sinners who try, fail, pick themselves up and try again, as good South Africans do”. Prof Prinsloo’s comprehensive version should be read in tandem with the Pretorius book. They cover the same period, but their focuses differ, resulting in two very different, complementary books. Piet Prinsloo’s book can be accessed free at https://repository.nwu.ac.za/handle/10394/26017 while the Pretorius book can likewise be accessed at http://hdl.handle.net/10394/26089 . The latter book is also available in printed version from the Office of the Vice-Chancellor, Private Bag X1290, Potchefstroom 2520. The price is R250 (VAT and postage included). Piet Prinsloo is a former rector of the Vaal Triangle campus of the NWU and a history professor. Cornia Pretorius is a lecturer at the NWU and a former journalist with the Sunday Times, Mail & Guardian and Beeld. Prof Piet Prinsloo, Prof Dan Kgwadi, vice-chancellor of the NWU, and Cornia Pretorius.